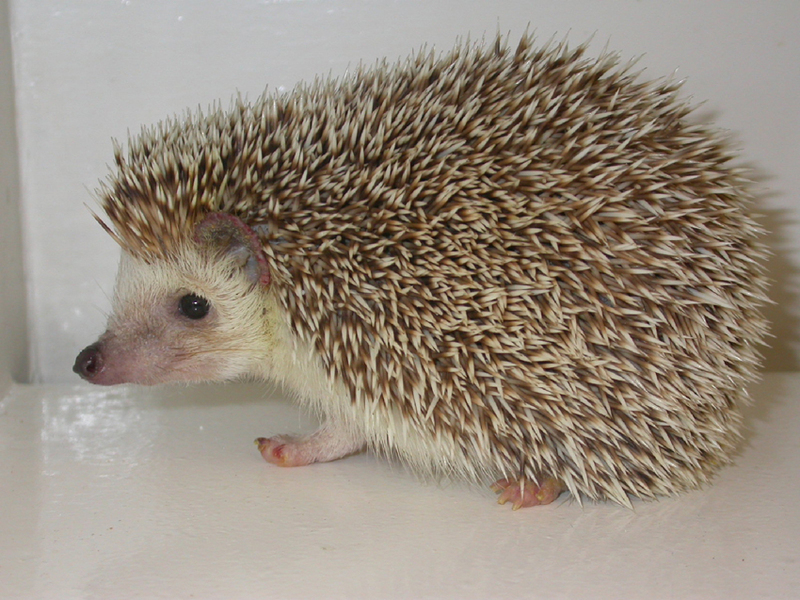 What type of cage does my pet hedgehog require? The cage should be large enough to allow the hedgehog to move around. 2 x 3 feet (61 x 91cm) should be the minimum floor space provided. Walls must be high enough to prevent escape, as hedgehogs are good climbers. A glass aquarium or smooth sided cage is a reasonable choice for many owners. An aquarium should be at least 30 gallons in volume. Cages with a wire bottom should be avoided as the hedgehog can easily injure a foot in the wire. Cages with a plastic bottom and wire walls may be used, as long as the space between the bars is 1 inch (2.5cm) or less. Remember, the biggest cage you can afford is too small! Bigger is always better. .
Hedgehogs are very active animals that seem to constantly run around; they are skilled climbers and diggers, and are even good swimmers. Hedgehogs can be let out of their cage to explore in a large supervised, secure room. Should I provide a heat source in my hedgehog's cage? Hedgehogs are very susceptible to extremes in temperature. The wild African hedgehog does not experience cold weather. If it does get cool it will become less active. "Hedgehogs seem to thrive with an environmental temperature of 70º - 85ºF (21º - 29ºC)." Heat stroke is possible with temperatures above 85ºF (29º C).Hedgehogs seem to thrive with an environmental temperature of 70º - 85ºF (21º - 29ºC). You may wish to consider placing a supplemental heat source under one end of the cage if the ambient house temperature is too low. My pet seems lonely. Can I house more than one hedgehog in each cage? What can I place in my hedgehog's cage? Hedgehogs are naturally nocturnal, and therefore do not like bright light. A hiding place, such as a cardboard or wooden box, cloth bag, PCV tubing, plastic log or plastic flowerpot works well to allow your hedgehog to avoid the light. If you put any objects made of cloth, it should be a fine enough fabric that the toenails do not get caught. Some Hedgehogs will use a litter tray but most defecate randomly. Unlike most other pet animals, hedgehogs do not play with toys. They do enjoy running on a wheel designed for hedgehogs (do not use wire wheels, because they can get their feet caught in the wire). "Enjoy running on a wheel designed for hedgehogs." Chew toys can also be placed in the cage, although they are not necessary. If you do provide chew toys, ensure that the smallest piece of the toy is too big to be swallowed by the hedgehog. Does my pet hedgehog need bedding material in his cage? Shredded paper, newspaper or recycled pelleted/absorbable material or wood shavings (such as aspen or pine) make fine bedding. Avoid corncobs, dusty shavings or cedar shavings, as they can be irritating. Clean the cage frequently. All feces, urine and uneaten food should be removed daily. Cages should be cleaned at least weekly, using soap and water (rinse well), or whenever they become dirty, as hedgehogs are susceptible to skin irritations from urine and feces.